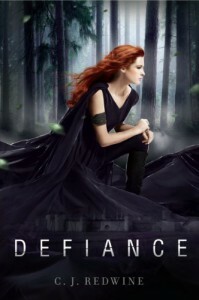 Defiance is a YA fantasy novel about a sixteen year old girl named Rachel. In Rachel's world, there are a couple of major cities all run by powerful leaders. Anyone who does not live in one of the cities, lives in the Wasteland, which is the forest area in between cities that is filled with dangers. Rachel lives in one of the cities with her father, who then goes missing in the Wastelands. After he disappears, Rachel must be appointed with a new guardian. Her father left his young, nineteen year old apprentice, Logan, as Rachel's protector, who Rachel does not get along with very well at first. Rachel is convinced that her father is alive and decides she can't leave him out in the Wastelands alone much longer, so she decides to come up with a plan to escape the city and go after her father, but she needs Logan's help. I really loved the world C.J. Redwine created in this series because it really seems like it's taking place in the past in the way that the cities and the city laws are very old-fashioned, so I really enjoyed that. 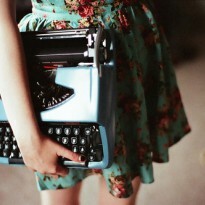 It seemed almost like biblical times, except with a bit more technology. I also really enjoyed the budding romance between Logan and Rachel. I don't enjoy books where the romance is very sudden and this was not like that at all. The romantic feelings each character felt were very obvious, but the plot focused more on the action and mystery through most of the story, which I enjoyed. I also found that Rachel was one of the few female characters in a YA book that did not annoy me at times. She was a very strong and smart character and I really enjoyed reading about her. I gave this book 4/5 stars. I thought it was fantastic and I really enjoyed it. I would recommend this to anyone who enjoys YA fantasies.